This essay was first published in the 2014 Shout! 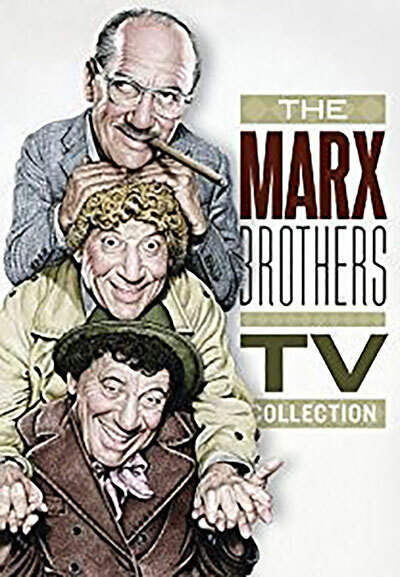 Factory DVD release, The Marx Brothers TV Collection. 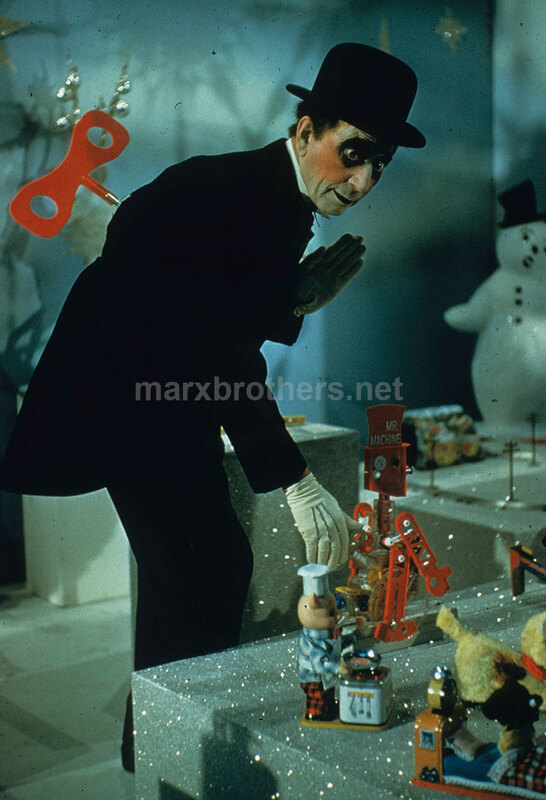 By the time the Marx Brothers’ last movie, Love Happy, premiered in 1949, the brothers had been working on stage, screen and radio for nearly fifty years. Television had arrived, but the middle-aged Marx Brothers – Groucho 59, Harpo 61 and Chico 62 – were not poised to take on the new medium – at least not collectively. But the end of their film career was perfectly timed for a collision with the birth of television. When the Marx Brothers first announced their retirement from the screen in 1941, they meant it. Their last M-G-M film, The Big Store was hardly a fitting farewell and did not invoke many memories of their best work at Paramount a decade earlier. By 1942 the brothers had all made other plans – Chico would front an orchestra, Groucho would try his hand at radio while doing some writing, and Harpo would raise a family and work when the spirit moved him. Chico’s band was successful – but not successful enough to finance the compulsive gambling habit he’d cultivated since childhood. Radio success eluded Groucho, who had become a frequent guest star on other people’s shows when his brief run as the host of Pabst Blue Ribbon Town ended. Harpo mostly performed for servicemen during World War II – as had Groucho and Chico. The opportunity for the brothers to reunite in 1946 appealed to all of them – Chico in particular because being a Marx Brother paid a lot more than being a bandleader. The resulting film, A Night In Casablanca is the best of their later films, but they immediately retired again. Television posed a threat to the movie and radio businesses, and there was a brief time when established stars were reluctant to appear in the new medium. Early television variety shows were structured in much the same way as a traditional eight-act vaudeville show, so the fledgling medium turned to older – and in some cases forgotten – stars from the vaudeville era. In 1949, television provided opportunities to people like sixty-three year old Ed Wynn, who debuted as the host of one of television’s first variety shows. Buster Keaton also enjoyed a comeback in early television. A slightly younger generation of vaudevillians, like Milton Berle and Jackie Gleason, found their greatest success on television, and used the medium to establish long careers. The new twist with television was that a performer could reach a larger audience in one night than he had in years on the road in vaudeville. It was a time of unlimited opportunity for both aging and up-and-coming stars. For Chico Marx, television was the next place where money could be made. Throughout the Marx Brothers’ career he was always the brother who pushed them to the next opportunity – often convincing his less confident brothers. Chico pushed for the Marx Brothers to get a Broadway show when they were the highest paid act in vaudeville. He saw the need for the team to make sound movies when the medium was brand new and they were making a small fortune on Broadway. Chico may not have been any more confident than his brothers, but unlike them, he always needed more money. Not surprisingly, he became the first Marx Brother to go on television on October 5, 1948, appearing as Milton Berle’s guest on the earliest example of “must-see TV” – The Texaco Star Theater. Chico made a handful of other television appearances in 1949 and 1950, before finally getting his own show, The College Bowl on the ABC network. Groucho had been enjoying his first real radio success with the quiz show You Bet Your Life, which was about to begin its fourth season on the air when it made the leap to television. It was not an easy leap. NBC and CBS were in a fierce bidding war for Groucho’s television services. When NBC finally made a deal for You Bet Your Life, CBS spitefully – and perhaps illegally – broadcast a filmed demonstration of Groucho’s show on their Popsicle Parade of Stars program on July 17, 1950 – stealing NBC’s thunder by advertising Groucho’s television debut as NBC announced the You Bet Your Life deal. You Bet Your Life premiered on television on October 5, 1950 – three days after the first broadcast of The College Bowl. Groucho filmed his show in Hollywood, but Chico’s was broadcast live from New York – which in those early days before videotape meant that the west coast saw the show on a time delay through filmed kinescopes of the live broadcast. Chico’s show lasted just twenty-six weeks, but Groucho continued with You Bet Your Life until the spring of 1961, for a total of fourteen seasons on radio and television. Harpo was the last of the brothers to make his television debut. His insistence on maintaining his silent persona made television a challenging option. The networks couldn’t figure out what to do with a non-speaking comedian. Harpo signed a contract with NBC on January 1, 1952 – but not for a show of his own. He would appear as a guest on various NBC variety shows like The Colgate Comedy Hour, U.S Royal Showcase, The RCA-Victor Show, and The All Star Revue. 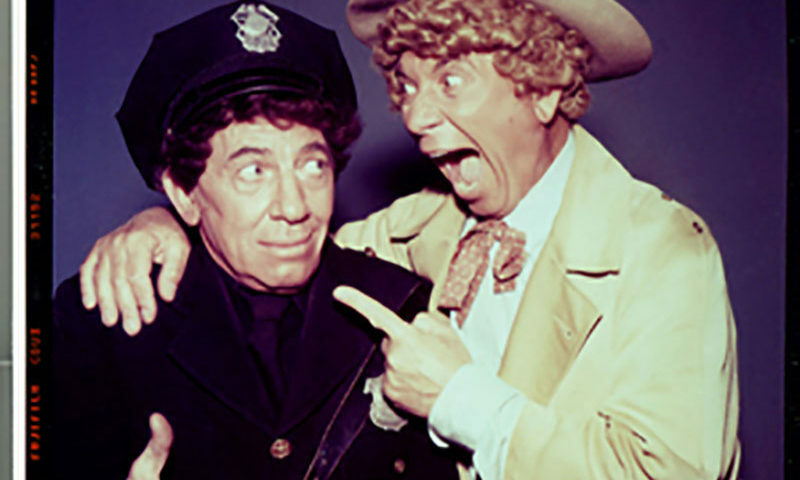 Harpo made his television debut on November 11, 1951, in the first of his four appearances on The Colgate Comedy Hour – one of which featured a rare television get together with Chico. In the summer of 1949, Harpo and Chico teamed up for a month-long engagement at the London Palladium. The act they worked up was also performed frequently throughout the 1950s, mostly in Las Vegas, where they appeared several times. They only made one television variety show appearance together during this period. The Colgate Comedy Hour from March 30, 1952 was long thought to be lost, but a kinescope of show highlights was recently discovered in the attic of Harpo’s daughter, Minnie. Early live television was often not preserved, and when it was, it was in the form of inferior kinescopes – films shot off of a television monitor. When considering the Marx Brothers television legacy, one of the first things people of several generations think of is Harpo and Lucille Ball recreating the mirror scene from Duck Soup. Harpo’s famous May 9, 1955 appearance on I Love Lucy, has been rerun in syndication for decades and seen by an audience in the millions, by virtue of the show having been shot on film. 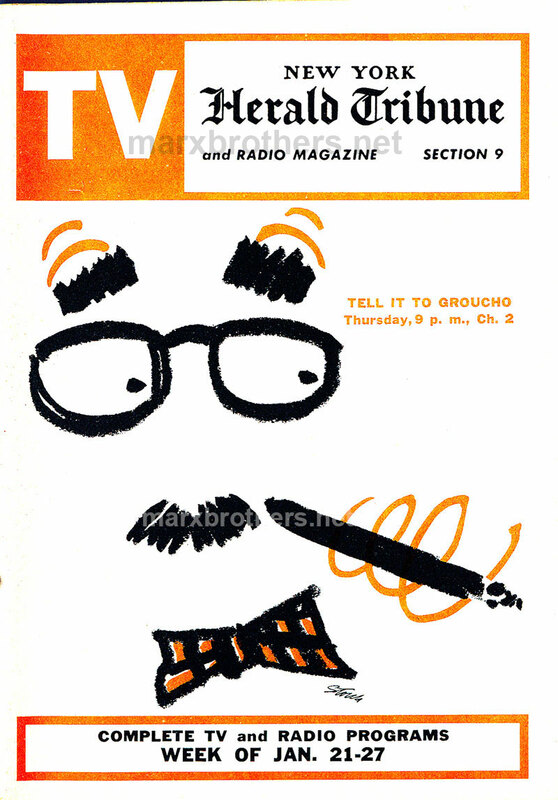 Groucho’s equally entertaining appearance on The Jack Benny Show – broadcast live five weeks earlier on April 3, 1955 – only survives on a kinescope. Later filmed episodes of the Benny show were syndicated, but the live shows never were, due to the quality of the kinescopes. Had Benny not given a kinescope to Groucho shortly after the broadcast, this magical television event might very well have been lost, because Benny’s archive somehow did not have a copy of the kinescope. The kinescopes that survive of the Marx Brothers’ television work in the 1950s reveal them in an unfamiliar context. 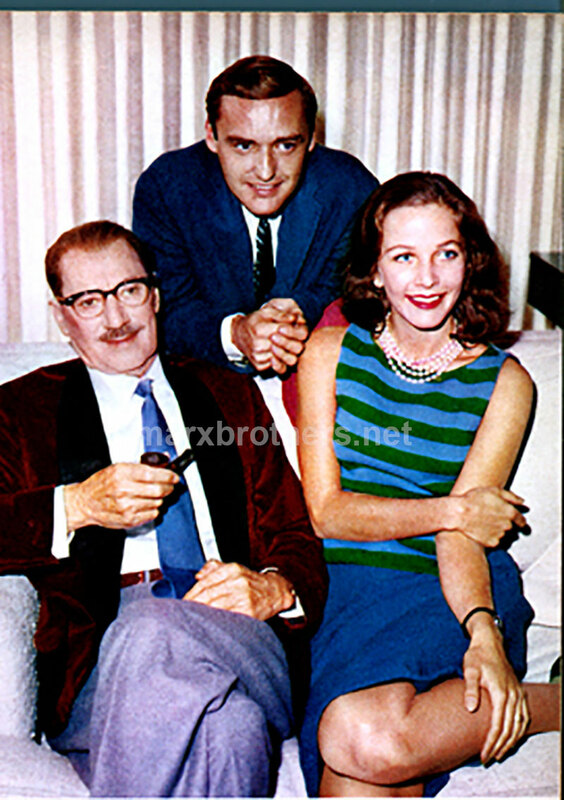 Fans are well aware of Groucho’s post-movie success as the star of You Bet Your Life – which had a lengthy life in syndication that helped fuel a Marx Brothers renaissance in the 1960s and 1970s. But throughout the show’s original eleven-year run on television, Groucho appeared on numerous live variety shows, singing, dancing, and generally being Groucho. He even occasionally disrupted the proceedings on game shows, where his ad-libs must have frightened hosts and sponsors. (Ironic, considering his own game show was filmed and carefully edited.) Harpo and Chico appeared on game shows as well. Chico went on I’ve Got A Secret in 1954 impersonating Harpo – his secret being that he was Chico! Some of the great treasures captured by the kinescope camera are recordings of the Marx Brothers reprising material they performed on vaudeville stages when they were just starting out. While some vaudeville material was used in their films – the classroom scene in Horse Feathers, for example, is straight out of their 1911 act, Fun in High School – kinescopes have preserved the only recordings of the Marx Brothers performing some of their earliest material. Harpo and Chico began doing their fourhanded piano solo in 1912 when they were touring the country in Mr. Green’s Reception, one of the team’s first big successes. It was captured on film in The Big Store in 1941, but it was part of their act for decades, and the March 30, 1952 performance from The Colgate Comedy Hour offers a rare look at what Harpo and Chico were doing on stage in London and Las Vegas forty years after Mr. Green’s Reception. The Marx Brothers only appeared together on television a handful of times – acknowledging their days as a team were long over. Groucho, Harpo and Chico all appeared on NBC’s Sunday Spectacular program, Inside Beverly Hills on January 29, 1956, but while Groucho and Chico performed together, Harpo appeared in a separate filmed segment with his family. On February 18, 1957, Gummo and Zeppo Marx – both seldom seen on television – joined Groucho and Harpo at the Hollywood Civic Playhouse for Chico’s opening night in the touring play, The Fifth Season. Gatherings of all five Marx brothers were rare, and for this occasion television cameras captured an interview with the quintet – but the recording was lost and has not been seen since it was broadcast that evening on the NBC program, Tonight: America After Dark. Getting Groucho, Harpo and Chico on camera together proved to be a difficult task for television networks. 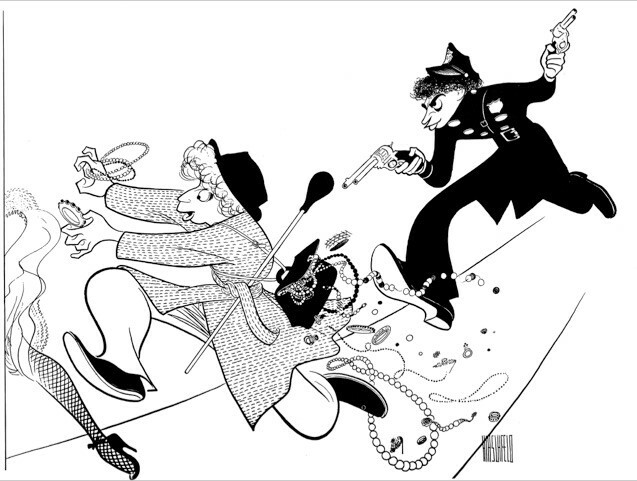 A General Electric Theater episode called, The Incredible Jewel Robbery was conceived as a vehicle for Harpo and Chico. Groucho’s brief surprise appearance at the show’s conclusion brought down the curtain on the Marx Brothers as a team. Groucho, Harpo and Chico continued to appear on television individually, but that March 8, 1959 broadcast turned out to be their last public appearance together. During television’s first decade, Groucho, Harpo and Chico were a constant presence in American living rooms. There didn’t seem to be any type of show where a Marx Brother couldn’t turn up. Harpo challenged Sam Snead on Celebrity Golf, Chico played Championship Bridge with Charles Goren, and Groucho did battle with Minnesota Fats on Celebrity Billiards. As they had been for their entire career, the Marx Brothers were versatile on television. In the fall of 1951 – around the same time he made his television debut – Harpo filmed a series of commercials for Meyenberg’s All Pure evaporated milk that would best be described as unusual. A decade later his commercials for Labatt’s beer were surreal. Television provided an unexpected and wonderful coda to the career of the Marx Brothers. Chico still played the piano and mangled the language – and occasionally his own Italian accent – while always armed with the impish grin familiar from the Marx Brothers films. Harpo played the harp, chased blondes and created more mayhem on live television than the movies could hold. Groucho was simply Groucho. Unlike his brothers he mostly abandoned his familiar movie appearance, only donning the iconic greasepaint moustache and frock coat on a few rare occasions. But he didn’t need to look like he did in the movies. He became a television star, and his real moustache and bow tie became just as recognizable and iconic as his movie costume. It was the twilight of the greatest comedy team there ever was. They could still fracture an audience, and somehow they often managed to look even better than they did in their last few films. Television was like a fountain of youth for the Marx Brothers – and they discovered it in front of the largest audience they’d ever had. Groucho, Harpo and Chico had come full circle. They had arrived on America’s vaudeville stages, and said farewell by invading its living rooms.